Sacramento Got Some Asian Flava, OK?!? | AYAH! If you don’t live in Sacramento, you may be fooled into thinking this is a sleepy little town, more known for California politics, than for its vibrant and diverse ethnic food scene. But we have one! There are great places to eat, everywhere. My favorite spots are in Little Saigon. It’s south of the downtown/midtown area. It’s block after block of strip malls, filled with all manner of Asian markets, Pho restaurants, Chinese restaurants and the occasional boba shop. It’s not swanky and most places aren’t new, or even inviting. In fact, I know it must be intimidating if you don’t know the language, food and smells. But if you’re willing to step out of your comfort zone, you’ll find that this nondescript area, tucked away on Stockton Blvd., is a culinary treasure. And it’s not just a place to eat; you can shop, get a massage, get your taxes done and invest in real estate — all within a few city blocks. I’ve featured a lot of places in Little Saigon, but in this post — I wanted to show people what it could be like to spend a day there. My boyfriend and I were headed to Little Saigon with just a tinge of hunger in our bellies. This is an optimal time to go to Little Saigon because it’s easy to go gaga over the food there. But it’s not so great, if you have a planned dinner with your parents in just a few hours, they’re treating you, and you better not fill up beforehand. But we already knew where this was headed — dinner was pretty much spoiled. Our end goal was to get some grocery shopping done at Ranch 99. We had a ton of Asian ingredients we needed to stock up on. But we decided to make a little detour to Duc Huong — a storied Vietnamese/French bakery with the best baguettes and therefore, the best Bahn Mi sandwich in town. But as we got out of our car, we made yet another detour on our detour. A store just a few shops down from Duc Huong caught our attention. It had a big “Grand Opening” sign outside, beckoning us in. The store is called “De Nhat Ko Bo”. I’m not sure what that translates to, but it’s basically an Asian snack paradise. 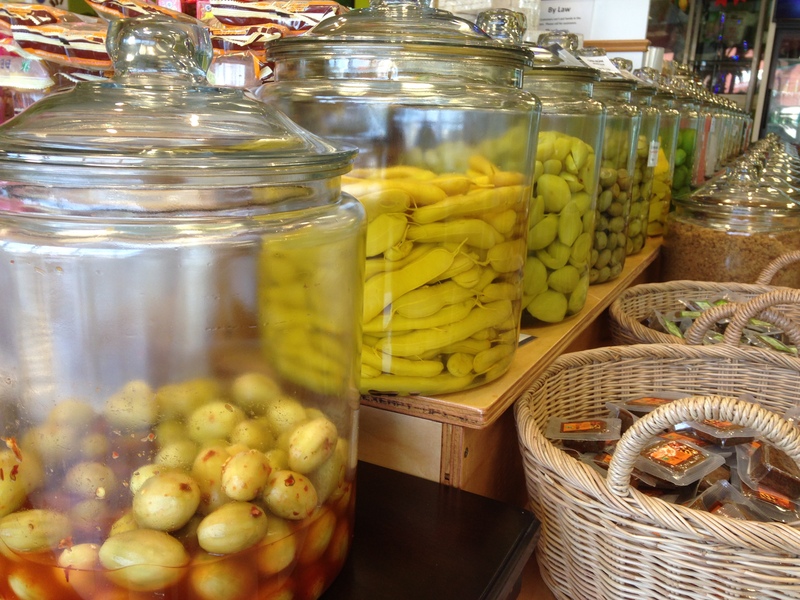 There are rows upon rows of glass jars containing dried fruit, pickled fruit, spicy dried and pickled fruit, wild flavors of beef jerky, shredded squid, fried mini crabs, exotic nuts, seeds — the list goes on. If you’re willing to eat it, it’s there. 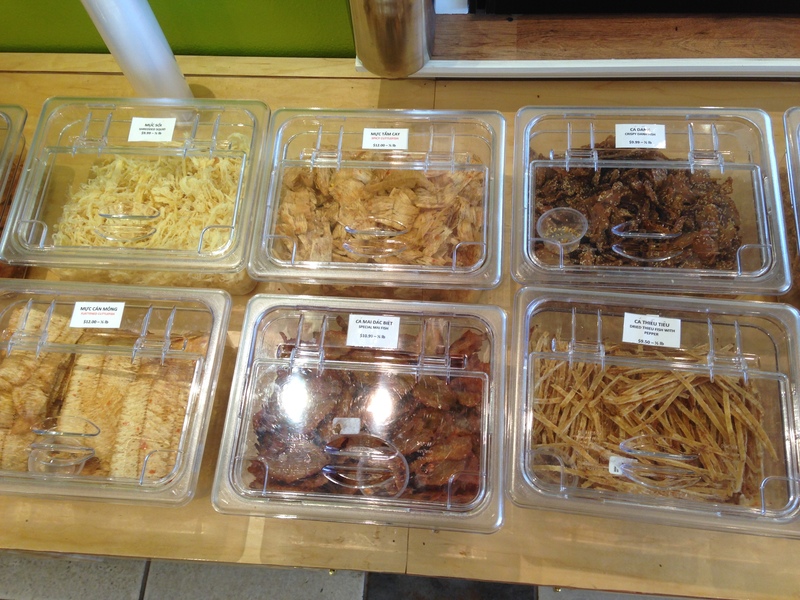 Many of the snack variations, I had never seen before in the U.S., only in Asian countries. Turns out, the owners have to import their selection. But don’t get too carried away. 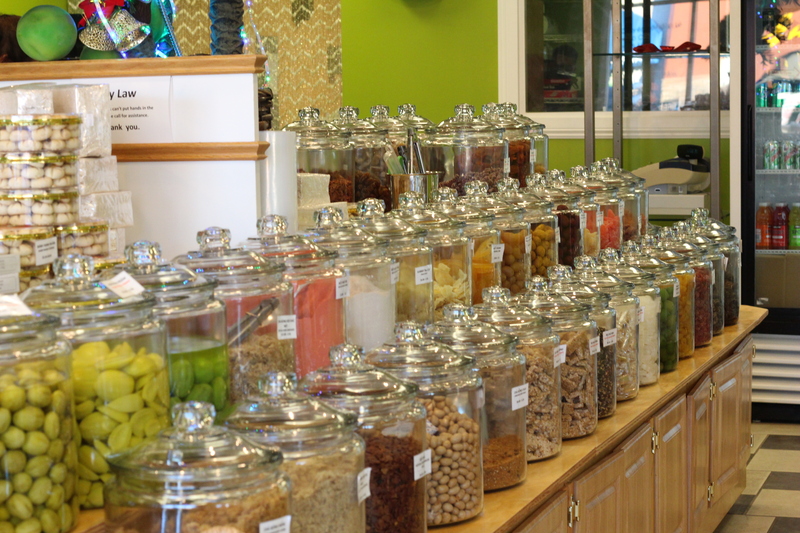 Because of health codes, customers can’t just open a jar and pick out what they want. Each item has to be handled by employees. I personally love the spicy shredded squid. My boyfriend enjoys the spicy beef jerky. we both love the dried plums. There’s an extremely spicy version for the brave, or you can go with the mildly spicy and not burn your tastebuds off. 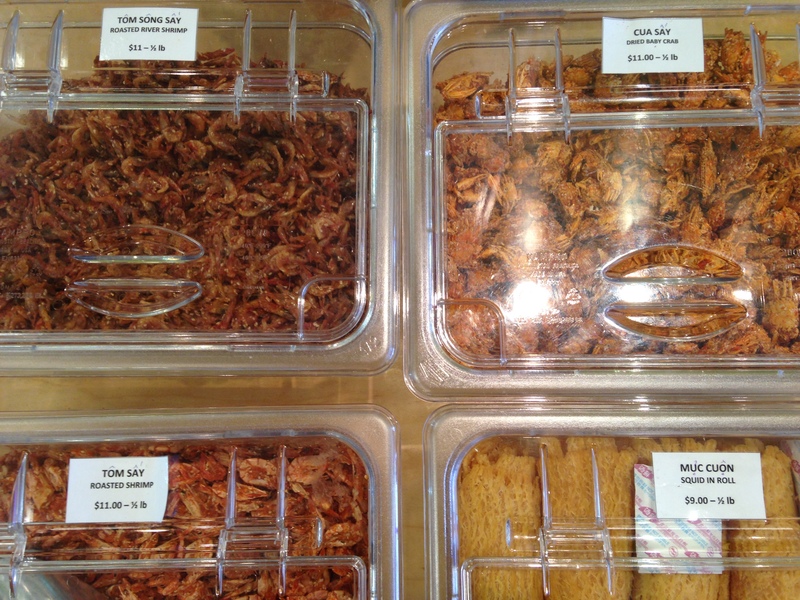 And if you don’t know what something is, the employees are happy to give you a taste of whatever you’d like to try. Once you decide you want to drop some cash, they’ll bag it up for you and sell it by weight. If you’re in the area — check out De Nhat Ko Bo on Stockton Boulevard and 65th Street. We dropped about $60 on our first visit (we got a little carried away). OK, onto Duc Huong (and their much more affordable Bahn Mi sandwiches!). The first thing you’ll notice about this bakery is the smell of freshly baked bread. It’s wonderful. And the things they put in the bread are even better. 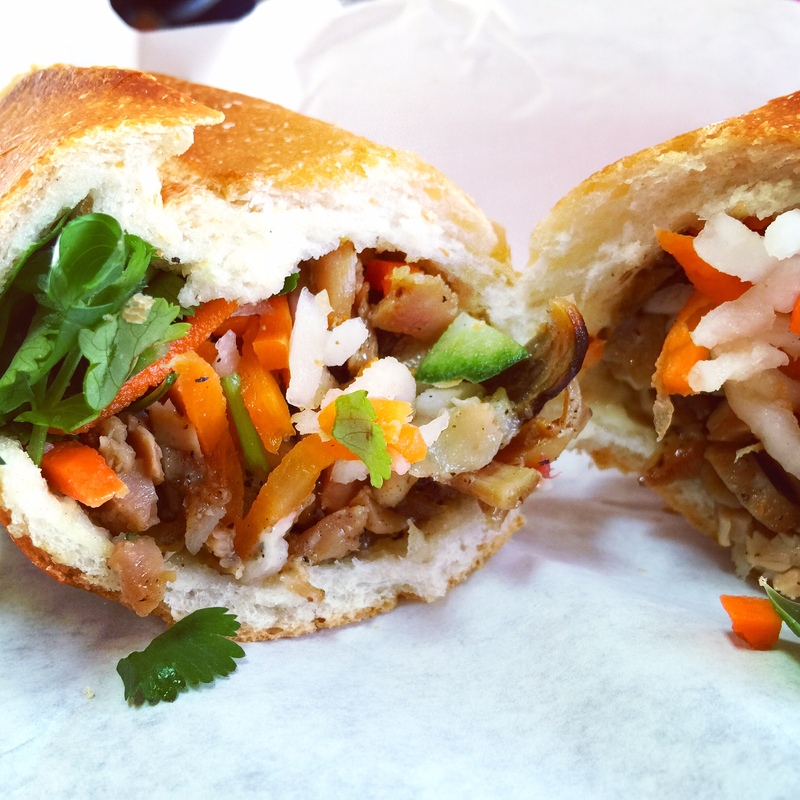 We ordered a Bahn Mi sandwich — to die for. If this is the last Bahn Mi you’ll ever eat in your lifetime, please go to Duc Huong. The bread is fresh and crispy. Tap on it with your fingers and you’ll hear a crisp, sturdy sound. And when you bite into — hold the phone. The meat, pickled veggies and herbs come alive, exploding with flavor. That, coupled with the fresh bread is like heaven. And the best thing to wash it all down with? 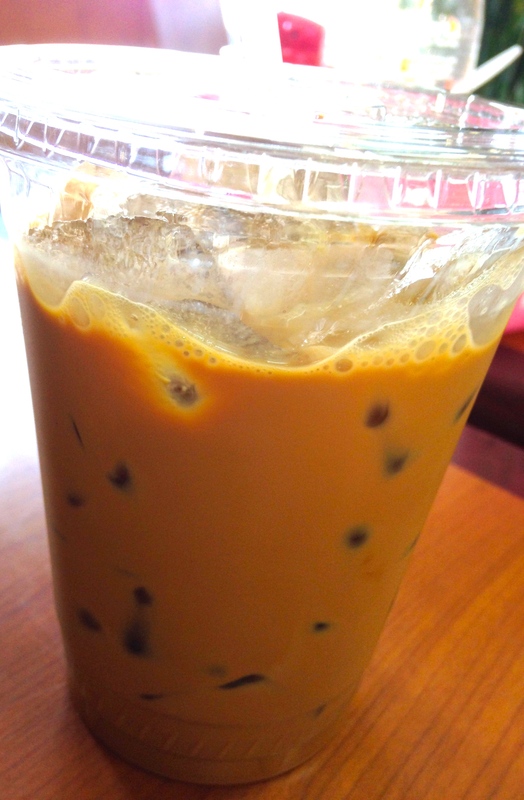 Vietnamese Iced coffee, one of my favorite things in the world. The already rich coffee, combined with the thickness of condensed milk — is the perfect thing to cool off that Jalapeño and Sriracha in the sandwich. Now with dinner officially spoiled, there was at least one upside — we wouldn’t go to Ranch 99 hungry. And that’s always dangerous with all those Asian snack aisles lurking. Just a tip if you go to the Sacramento store — bring a parka. They turn up the cold in there! So, there you have it. Just a couple hours in Little Saigon made for a very delicious outing. Below, you’ll find some information about each of these places, so that you can chow down too.